In the heart of Berlin. Discover this boutique hotel in the centre of Berlin, close to the famous Kurfürstendamm shopping area. Experience the great flair of Berlin during your stay at the Hotel Art Nouveau in Charlottenburg: Take the historical lift to the reception where your host Ingo Bethke will welcome you personally. After acquiring the hotel in April 2016, it has undergone a revamp under his watchful eye and has a new sparkle. Choose between 21 individually designed hotel rooms, including three suites. There are also a lounge and two conference rooms for congresses and receptions. Enjoy a lovingly prepared breakfast with home-made and specially selected delicacies. We invite you to enjoy a sundowner on the roof terrace of our Jugendstil building. Our hotel has 21 individually equipped rooms including three suites: stucco ceilings, board flooring and antiques blend with a carefully selected contemporary interior. A balanced Farrow & Ball colour concept completes this urban, relaxing and comfortable atmosphere. 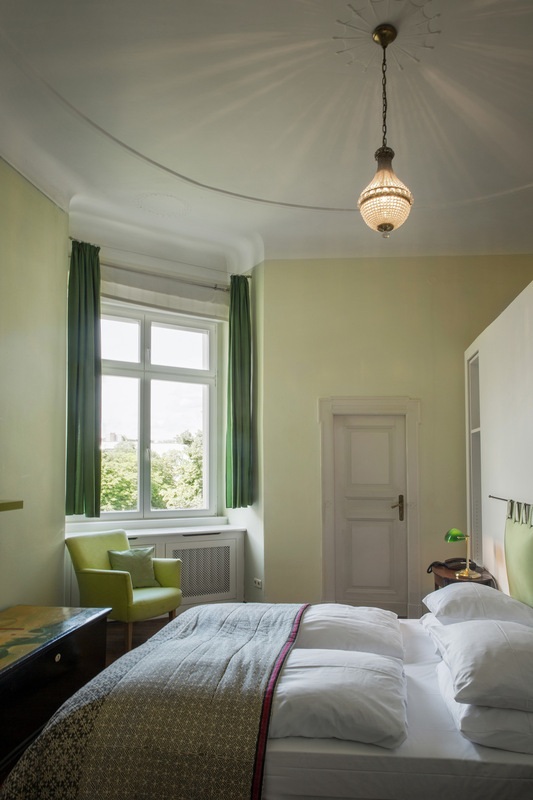 You find the Berlin boutique Hotel Art Nouveau in a typical Charlottenburg Jugendstil building on Leibnizstraße 59. Kurfürstendamm and Savignyplatz with its restaurants and bars are each just a stone’s throw away. Our hotel has good access to public transport and directly across from the hotel is a parking garage. Thanks to a public airport shuttle, airport Tegel is reachable in short time. Stay at the Hotel Art Nouveau with or without breakfast - it’s your choice. We recommend to start your day with a delicious breakfast for 12€ per person. Espresso, Cappuccino, Latte Macchiato - whatever starts your day off best. Freshly prepared boiled or scrambled eggs, homemade jam and cakes, and selected meat products and cheese specialities are part of our breakfast buffet. During your entire stay you can consume coffee, tea, soft drinks, liquors and selected international wines from our Honesty bar. The Hotel Art Nouveau in Berlin-Charlottenburg has three conference rooms. These are perfectly suited for seminars, conferences and workshops and for up to 25 people. The conference rooms can be booked separately or together depending on the extent and format of your event. Our tastefully equipped conference rooms are also best suited for receptions. The big and the small conference room are connected through a wood panelled Berliner-Herrenzimmer (lounge) which is a great venue for a get-together. The conference rooms are fully equipped with flipcharts, a beamer and whiteboards. We would be pleased to organise the catering for your event: starting with breakfast, lunch, coffee and cake and ending with dinner. Please use the contact form or call us directly on +49 (0)30 3277440 for a booking request. The Hotel Art Nouveau is located in Charlottenburg, a very popular quarter in the western part of Berlin. Tradition and modernity meet here at every corner: It is a cultural hub with many theaters, cinemas and jazz bars close by: The Theater des Westens, Delphi cinema, the Jazz club Quasimodo, the A-Trane in the Bleibtreustrasse or the Renaissance-Theater with it’s exquisite productions. There are also outanding international restaurants closeby: The Paris Bar, as a centre for night lovers with an intellectual demand or the Austrian Ottenthal, are only two examples of places to visit in Charlottenburg. Another highlight in West Berlin for locals as well as for tourists is the photo gallery C/O Berlin in the Hardenbergstraße. To enjoy a mediterranean atmosphere a visit to one of the best markets of Berlin on a Saturday at Karl-August-Platz, is an absolute must. Through our immediate vicinity to Kurfürstendamm a visit to the many brand name shops are within walking distance. If you book directly via our website you’ll always get the best price and a free welcome drink on arrival at our Honesty bar. If you want to arrive after 8 pm please let us know via telephone or e-mail so that we can make arrangements for the hand-over of keys. Waiting periods should be prevented. No one likes to wait. The free cancellation period ends 24 hours before check-in. Exceptions are during exhibition periods or when especially stated. If you cancel later or don’t show we can charge up to 80% of the price for the first night. During exhibition periods and events a free cancellation is only possible until a week before the exhibition or event starts, if not arranged differently. If you pay in advance a refund is possible with a cost deduction and only if the room could be rebooked. Via the black and white button you can book a room. Enter your travel dates and you receive a booking confirmation directly. You are welcome to inform us directly via telephone about your booking request.